I do know with perfect and certain clarity through the power of the Holy Ghost that Jesus is the Christ, the Beloved Son of God. My dear brothers and sisters across the world, my knees are weak and my emotions close to the surface. I express my love for you and profoundly thank you for your sustaining vote. In so many dimensions, I feel inadequate and humbled. I take solace that in one qualification for the holy apostleship where there can be no latitude extended, the Lord has deeply blessed me. I do know with perfect and certain clarity through the power of the Holy Ghost that Jesus is the Christ, the Beloved Son of God. There is no man with more love than President Thomas S. Monson. His warmth is as the sunshine at midday. 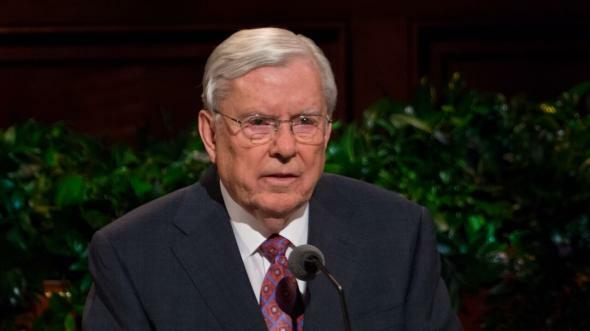 Yet, as he extended to me this sacred call, you can imagine the overwhelming soberness I felt as the eyes of the prophet of God peered deeply into the chambers of my soul. 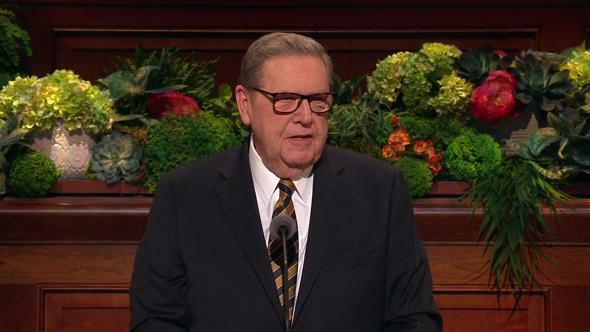 Happily, you can also imagine the love I felt from the Lord and from His prophet as President Monson wrapped his long and loving arms around me. I love you, President Monson. To those who know me, if ever I have been less than I should have been in your presence, I ask for your forgiveness and patience. I so very much need your faith and prayers in my behalf. I know that I am not what I must become. I pray that I might be willing and moldable to the Lord’s tutoring and correction. 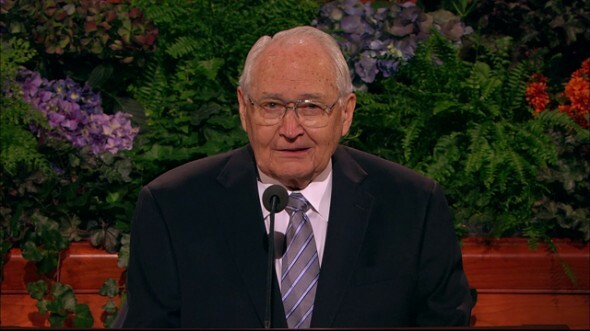 I take comfort from the words of President Monson last night in the priesthood session that the Lord will shape the back to fit the burden placed upon it. I express deep gratitude for you, the faithful members of the Church. As a young missionary in France, I felt my testimony blossom as I witnessed members giving their full devotion for the gospel of Jesus Christ. During the past 20 years, we have lived 10 years outside of the United States on Church assignments. In lands and languages different from my own, I have seen the power of God at work in your lives. How wonderful you are—the great family of believers in the restored gospel of Jesus Christ. The Lord has blessed me in ways I could never repay. He allowed me to marry one of His angels here on earth. My wife, Kathy, is my light and example, a precious daughter of God, full of purity and innocence. I would be nothing without her. For much of my life, I have been trying to become what she thought I already was. Twenty years ago when our four children were young, our family was called to serve a mission in France. With this and other calls that followed, they found themselves moving from city to city, continent to continent during those years that plead for stability. The Lord has now richly blessed them with wonderful companions and choice children of their own. I want to thank them for their goodness and for their sacrifices in my behalf. I am also grateful for my faithful parents—my mother is here today—and for all those who have done so much for me throughout my life. I express my deep respect and love for my Brethren of the Seventy. I love them as I love my own brother. Our bond and friendship is not just of this world but will move with us through the veil. 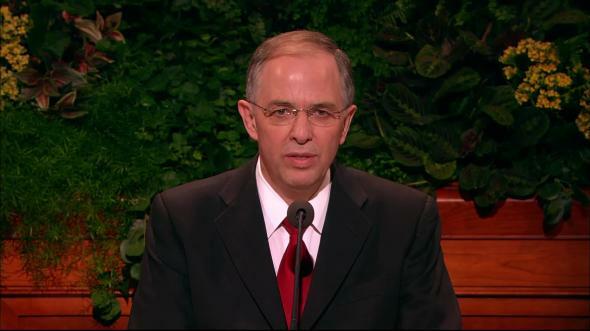 For 16 years the members of the First Presidency and the Twelve have been my examples and teachers. I have learned from their integrity and righteousness. In these many years, I have never observed any unbridled anger, any desire for private or material gain. Never have I seen any personal positioning for influence or power. Rather, I have seen their loyalty and care for their wives and children. 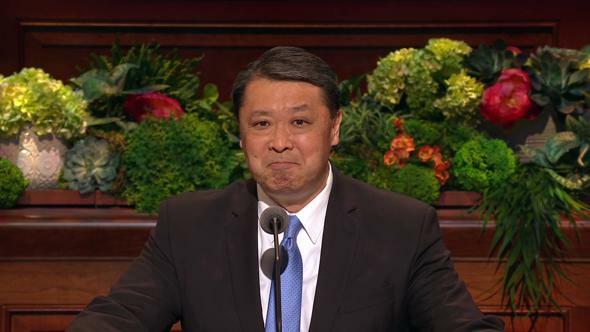 I have experienced their love and sure witness of our Heavenly Father and His Son. I have watched them untiringly seek first to build up the kingdom of God. I have seen the power of God rest upon them and magnify and sustain them. I have witnessed the fulfillment of their prophetic voice. I have seen the sick raised and nations blessed through their authority and have stood with them in moments too sacred to recount. I testify that they are the Lord’s anointed. 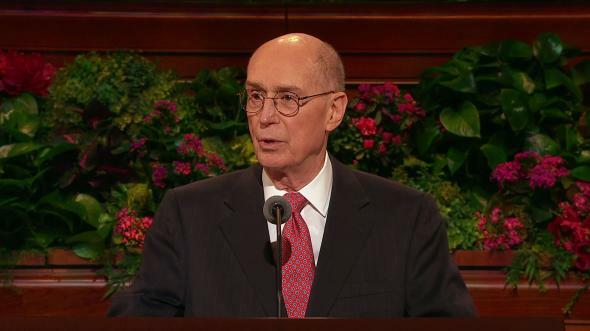 I pray that my spirit might be like that of Elder Joseph B. Wirthlin—whose passing brought about this call—a spirit void of any desire for personal attention, willing to go anywhere and do anything the Lord’s prophets would have me do, applying my full consecration in testifying of the Savior and building the kingdom of God until my final breath. Our days are days long anticipated in the history of the world. 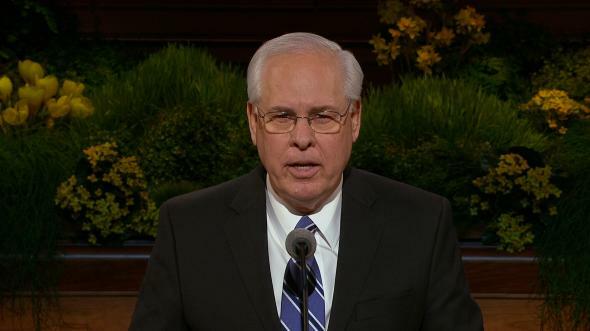 The scriptures speak of things “the Lord ordained and prepared before the foundation of the world” (D&C 128:5). The revelations tell of a great gathering that will take place (see 2 Nephi 10:7–8; 3 Nephi 16:5). Isaiah prophesied that the house of the Lord would be established in the tops of the mountains and that the voice of the Lord would go from there to the whole earth (see Isaiah 2:2–3). Daniel declared that it would be as a stone cut out of a mountain without hands (see Daniel 2:34, 44–45). Peter spoke of the restitution of all things (see Acts 3:20–21). Nephi saw that those of the Church of the Lamb would not be many in number but would be in every land and nation (see 1 Nephi 14:12, 14). We live in these days of the Lord’s “marvellous work and a wonder” (Isaiah 29:14; see 2 Nephi 25:17). 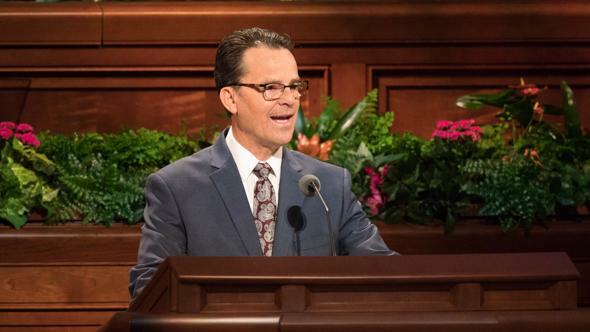 We have been blessed to bring the gospel to our families and our posterity and to assist in preparing for the Second Coming of the Savior. The Lord described the purposes of the Restoration “to be a light to the world, … to be a standard for [us, His] people, … and to be a messenger before [His] face to prepare the way before [Him]” (D&C 45:9). Our responsibility is not trivial; it is not by chance that we are who we are; the keeping of our covenants in these days of destiny will be a badge of honor throughout all the eternities. I have been privileged to see the Lord’s hand at work across the world. While we honor those pioneers who walked across the plains to the Salt Lake Valley, there are far more pioneers living today. 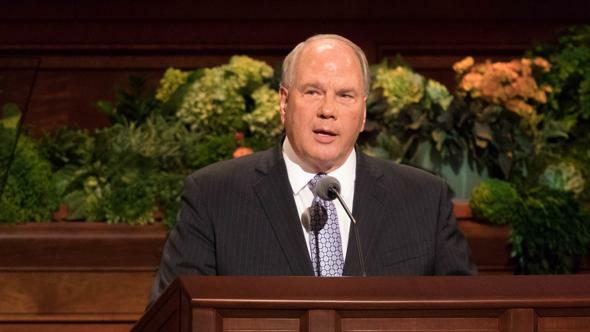 They don’t push handcarts, but they are exactly the same in so many ways: They have heard the voice of the Lord through the Book of Mormon and through their personal prayers. With faith and repentance they have stepped into the waters of baptism and firmly planted their feet in the rich gospel soil. As disciples of Christ, they have been willing to sacrifice for what is right and true. And with the gift of the Holy Ghost, they are holding steady in their course toward eternal life. We must remember, my dear brothers and sisters, who we are and what we have in our hands. We are not alone in our desire to do good; there are wonderful people of many faiths and beliefs. We are not alone in praying to our Heavenly Father or in receiving answers to our prayers; our Father loves all of His children. We are not alone in sacrificing for a greater cause; there are others who are unselfish. Others share our faith in Christ. There are loyal and decent fathers and mothers in every land who love each other and love their children. There is much we can learn from the good people all around us. Yet we must not shrink from what is uniquely and singularly found in The Church of Jesus Christ of Latter-day Saints. Only here is the priesthood of God, restored to earth by heavenly messengers. Only here does the Book of Mormon stand with the Bible in revealing and declaring the full divinity and gospel of Christ. Only here are there prophets of God, bringing guidance from heaven and holding the keys that bind in heaven what is bound on earth. Our knowledge of the divine mission of the Church should not bring feelings of superiority or arrogance but should take us to our knees, pleading for the Lord’s help that we might be what we should be. 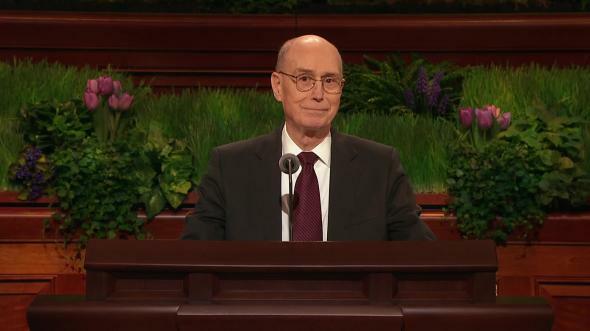 But in humility we need not be timid in remembering the Lord’s words: “This is my church, and I will establish it; and nothing shall overthrow it” (Mosiah 27:13). Above all, we proclaim our Savior and Redeemer, Jesus Christ. All that we are—all that we will ever be—we owe to Him. While we gaze in awe at His majesty, He does not ask us to stay our distance but bids us to come unto Him. “I stand at the door, and knock: if any man hear my voice, and open the door, I will come in to him” (Revelation 3:20). “And whosoever liveth and believeth in me shall never die” (John 11:25–26). Brothers and sisters, He lives. He is resurrected. He guides His holy work upon the earth. His prophet is President Thomas S. Monson. I so testify in the name of Jesus Christ, amen.